It was one of those days. Too much to do, and just not enough time to put together a complicated meal. And worse, it was mighty cold out. And snowing. The best solution to my problems? This slow cooker spicy kielbasa cabbage soup. Yes, three ingredients. That’s it. Great Campbell’s spicy V8 flavor (you could substitute any V8 flavor that you love! 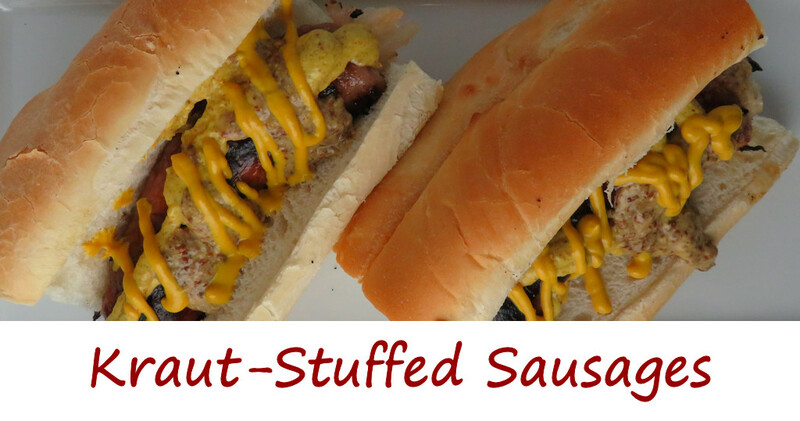 ), with yummy kielbasa sausage. Oh, and cabbage. It’s deceptively good, actually, and not what you might expect from something so easy. It’s perfect for a busy day. I prefer to brown most meats before adding them to the slow cooker. It adds a bit of texture and color and better flavor, in my opinion. But you don’t have to brown the kielbasa for this slow cooker spicy kielbasa cabbage soup first. Don’t let the ‘spicy’ part scare you. For us, at least, this soup did not come out overly spicy at all. The flavors mellow a bit as the soup cooks throughout the day. Also try my slow cooker tortellini soup. Add cabbage to bottom of slow cooker. Add juice, followed by the sausage. Cook on low for 8 hours, stirring every hour or so. Usually, a quick grilled dinner at our house consists of some burgers or dogs, with a side and a salad. 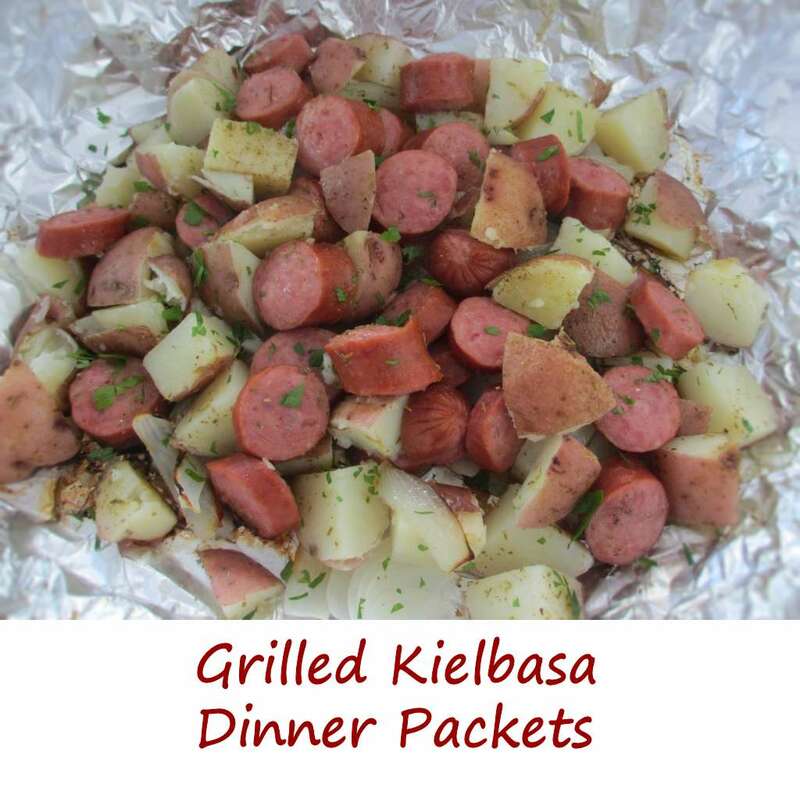 But sometimes, I like to throw together a just-as-easy meal-in-a-packet, like these grilled kielbasa dinner packets. Everything’s in there. Just assemble (you can put them together the night before) and toss onto a grill over medium heat until the vegetables are tender. Adding rosemary really takes this from a rather mundane dish to something a little more special. Next time, though, I’m adding chopped bell pepper or poblano for a little crunch. If you’re looking to cook up a great breakfast in a packet try my lumberjack breakfast packets. Fire up your grill for medium-heat (350 F) grilling. Tear off a large sheet of foil. Place sausage, potatoes, bell pepper (if using) and onion in center of foil. Drizzle with oi and sprinkle with salt, pepper, and rosemary. Fold up the edges of the packet and seal. Place onto grill and cook 30 minutes or so until the potatoes are tender. Be careful opening the packets as hot steam will get trapped inside.